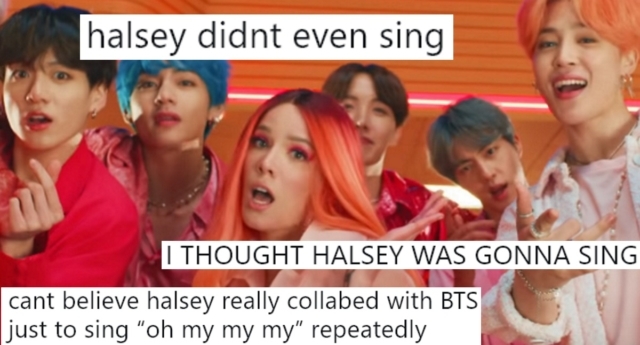 Many of the queer music lovers who were delighted to find out Halsey would feature in the South Korean band’s new song were crushed on Friday (April 12) when the video came out. After a brief appearance in the first shot, the bisexual American singer only shows up again two-and-a-half minutes later—more than halfway through the track. When she does show up, Halsey dances with BTS and joins in with a couple of lines like “Oh my my my”—but has no solo. The music video, which went live at 10am on Friday (April 12), has already amassed more than two million views on YouTube. Many BTS followers think that the Map of the Soul: Persona album tracklist, revealed on Monday (April 8), includes a song named after the bisexual, genderqueer Greek god Dionysus. One such fan wrote: “We got Dionysus in the tracklist and he’s a Greek god.